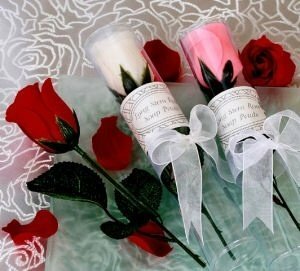 When you put these long-stem rose soap favors on the place settings or tables at your reception, your guests will be dazzled by the stunning presentation. Each long-stem rose is designed with "petals" that will dissolve to create a warm, rose-scented bath. 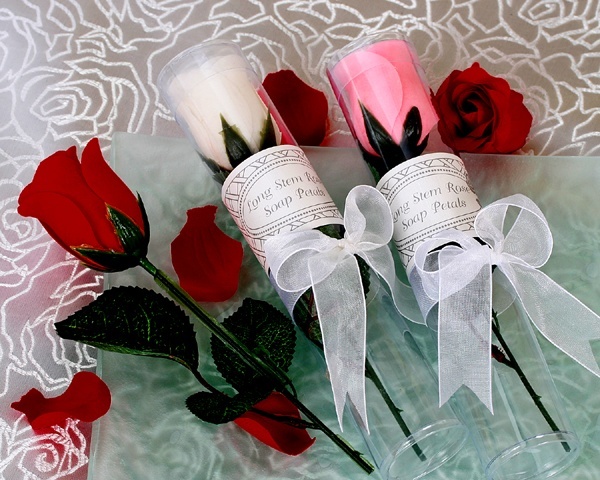 The 6" rose is presented in a clear cylindrical gift tube with a designer vellum ribbon that says - "Long Stem Rose Soap Petals" and is tied with a sheer organza ribbon. Available in red or white (specify at checkout).